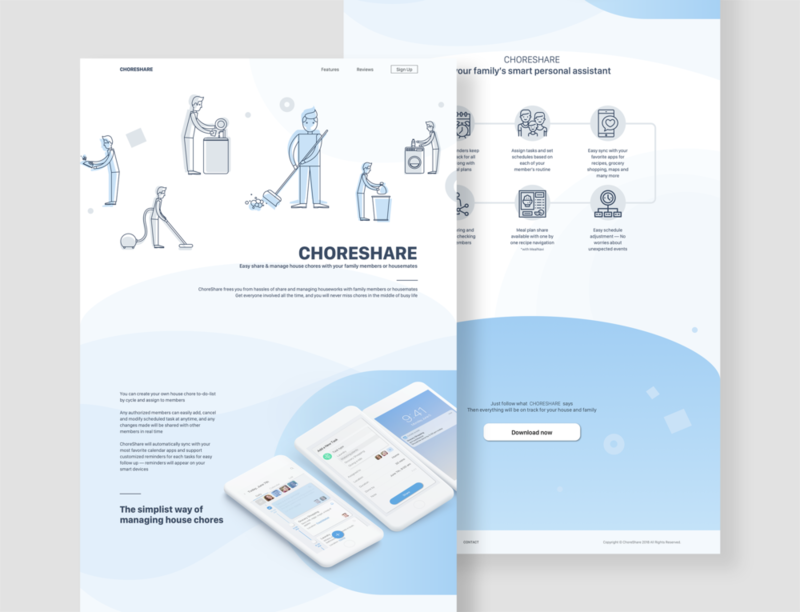 ChoreShare is a house chore management product sharable with household members. By letting the users create task list and manage it together with their members, it helps everyone get involved and become more responsible. It enables the user to assign each task based on the individual member’s schedule, and features smart reminder to help them never miss their tasks. It was assumed that I’ve been approached by an investor who believes that there is a big market out there for people wanting to manage house chores more efficiently (whether it’s cleaning, laundry, preparing meals, grocery shopping, etc. — should be applied to any kind of chores). The investor would like to create an app to help people with that. My role was to convince the investor that it would be best to understand the problem space a little better, to build some empathy with the household members to find out what is their primary demand. 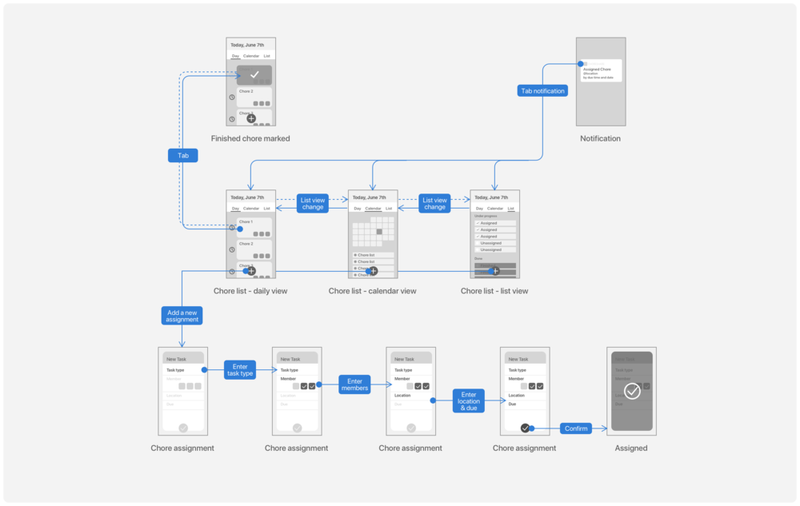 Create a user flow with wireframes, and deliver some mockup screens. Also design a landing page to introduce the product to its potential users. While the users visiting the website, they should be able to understand how the product could help them with their current problem. During the design process, researches should be done by following the research plan which also should be prepared by myself, to understand and empathy with the users and market. With research results and what learned from those, develop the concepts and idea from the scratch, and eventually put everything together for the final design solution—wireframes, mockups and a landing page. My first step was to create a research plan to show how you would conduct this research to gain these insights. And to get started, I needed to identify who I am targeting initially, what the best research methods are, and what my key areas of inquiry are (what are the main things I’m looking to learn about from the users?). Framing the research plan helped me structure the approach to understand the opportunities in the targeting market. 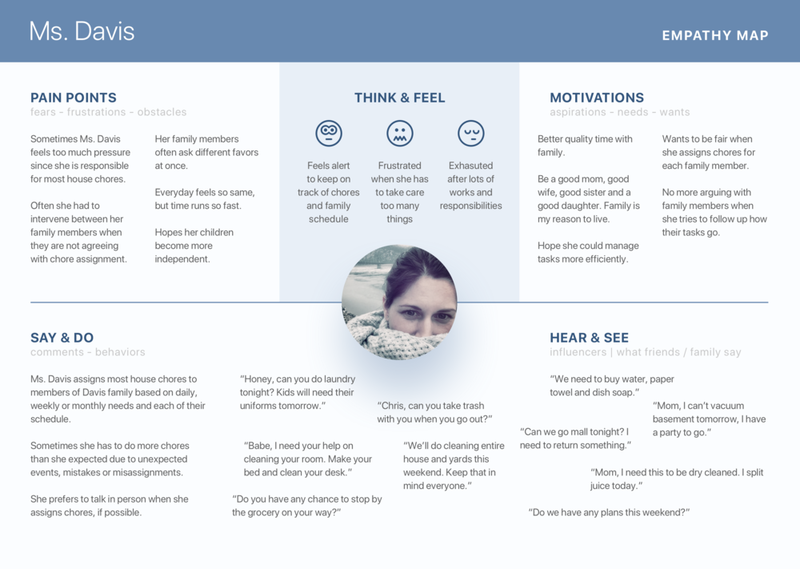 To understand and empathy with the user better, I created an empathy map of potential users emotional states. I interviewed two members of a family of a husband and a wife with two kids from Midwest suburb area. 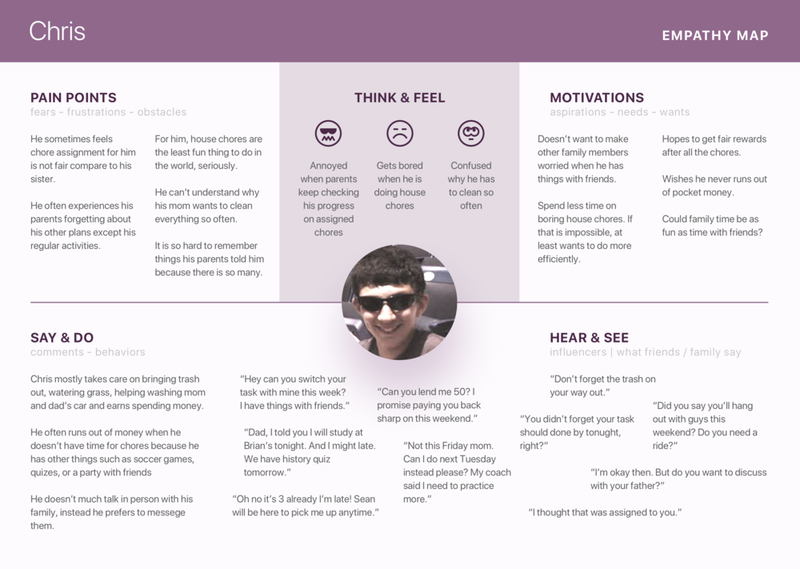 I fill out the empathy map based on the interview over the phone call. Most of our talk was focused on how their family and themselves take care house chores and how they manage everyday routine. I tried to focus on details happened to David family (persona) while they try to achieve their goal. In the story, it shows how they solve their problem on their own way without any help from the future product, to find out current situations and problems more in detail. I reframed the design problem by Point of View statements (POV statements) to expand thinking and gain a clearer insight into the real problems facing the users. I looked to industry thought leaders IDEO to learn their philosophy on ‘How Might We’ statements, and tried to focus on three main elements: The User, Need, and Insight. And Based on the previous research with those ‘How Might We’ statements that I’ve generated, I sketched out potential solutions. I ended up picking four HMW questions that I liked most, and imagined solutions regardless of limitations or resources. I observed and tested other products that helps users to manage their house chores. None of them offers both chore do-to list blending into user’s daily routine and progress monitoring at the once. 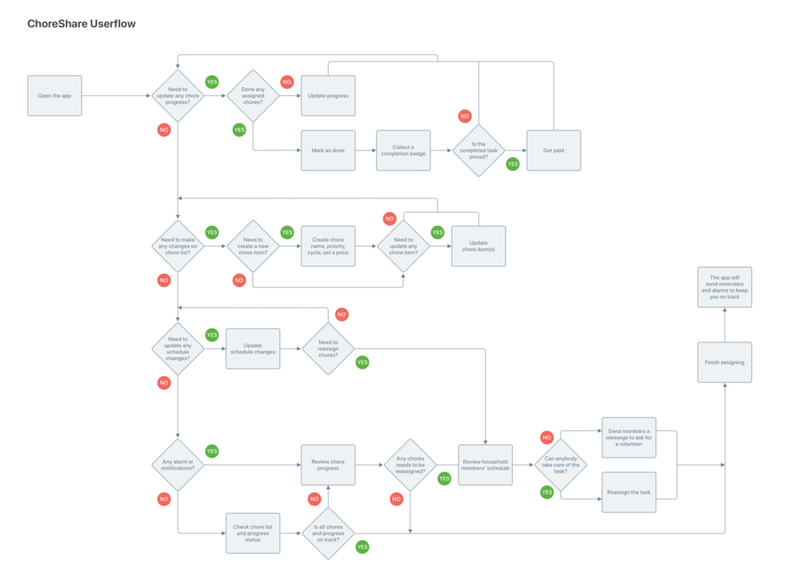 · Make the chore progress could be monitored at once. · Make small chores and tasks automatically blend into users daily routine. · Provide smart reminders and alarms to help users keep on track. · Price each chores based on the amount of the work and let users get paid when they complete jobs. · Offers easy communication function to help users have more flexibility. After taking information, gleaning insights and articulating the problems, I synthesized insights and ideas into a landing page describing a product with an MVP (Minimum Viable Product) set of features. I began with writing a featured list and about the product. Focusing on making the product's concept and feature set clear and easy to understand, I finally created a landing page by building a grid system, adding photos and writings in places.